Who's the "real" "bad guy" in the highly politicized scenario playing out before us on the radio, on the nightly news, in our daily papers, and across the internet? What do the players REALLY want? What do WE really want? Why is the play important? What does the very performance say about us as a people? And which sides of the players REALLY concern us? Bill CLinton? Warm, personable and popular? Left-wing political and financial opportunist? Leading the most powerful nation on the planet? Pot smoking baby-boomer? Highest public approval ratings in over 30 years? Or "sexual predator?" Hillary Rodham Clinton? Cool, calculating and forceful? Legal and financial opportunist? First Lady and peoples' activist? Making the Man or riding his coat tails? More jeered than cheered? Or "ball-busting feminist?" 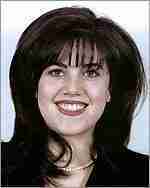 Monica Lewinski? Shy, retiring and fearful pawn? "Sexual opportunist?" Bright young woman making her way in a "man's world?" Drawn to men of power to achieve her goals? Pitied and under-recognized? Or "over-ambitious playgirl?" 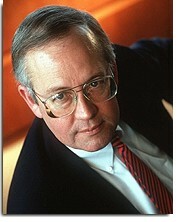 Kenneth Starr? "Morally righteous crusader?" Right-wing legal and political opportunist? Overreaching and overreacting political watch dog? Hot corporate finance and take-over attorney? Or "sexual malcontent?" If the travesty in Washington weren't so utterly tragic, it would be comical. I'm personally frustrated that the "Flagship of Democracy," the "Land of the Free and the Home of the Brave," has become the sanctimoneous laughing stock, not only of its own citizens, but of the international community, their leaders included. Throughout the world, and throughout the media, one national leader after another has publicly voiced his or her absolute amazement and utter horror that WE have allowed Starr to so blatently exceed, to violate, and to ultimately dispense with his original charter as White Water Special Prosecutor in his politically motivated drive to unseat an opposing party President by any means fair or foul. Starr has readily and often been dubbed the McCarthy of the '90s, but WE ARE NOT HEARING THE MESSAGE! What will it take to get us active? What will it take to get us to take responsibility for our own freedoms, and to extend them to ALL Americans, including those we choose to lead and to represent us? WE would do well to realize that the outcome of the Clinton debacle, for good or ill, WILL be cited as precedent for many years and on many points of civil law; and all because WE sat back and let a frustrated "judge-wannabe" pursue an humiliating and deceitful inquisition well beyond the scope of his original charter. For a well written treatise on many subjects that underpin this page and its views, Please be welcome to visit the fine web book sales page "Ain't Nobody's Business if You Do!" This excellent book on the audacity of prohibition, and the absurdity of "consentual crime" is for sale, both in paperback, on disk, or as a PDF file, but may also be read in its entirety online at the site. And, If you'd like to DO SOMETHING about our currently out of control political debacle; please visit this site, sign their petitions, sign their petitions, and do what you can to help prevent further abuses of our constitution and insult to our nation's people. FLASH!! Saturday, December the 19th, 1998: NOW, they've done it!! On this date, the U.S. House of Representatives -- MY REPRESENTATIVES -- FAILED to heed MY call, and the call of NEARLY 70% OF THE VOTING POPULATION OF THE UNITED STATES! Against overwhelming popular acclaim and resistance, they have IMPEACHED MY PRESIDENT, a man placed in office TWICE by popular will, to serve OUR needs. This page serves as notice to the men and women of "power" who view themselves as above the will of the CITIZENS OF THE UNITED STATES: Your time has come. The years 1999 and 2000 should prove very intriguing to you, both at the ballot box and within your spheres of influence and economics. This is a front view of the White House. I was taught as a child, as I'm sure most of us were, that this was a place of reverence, both home and office to the most powerful man on Earth: the President of the United States of America. I was further taught, also as most of us were, that HE was placed there by the people of the United States because HE best reflected what WE stood for, and that HE would most readily and capably act and conduct himself as WE willed, and in our best interests. In our minds, WE created the "Fortress of Solitude," and installed Superman at the helm. WE nearly and neatly made him answerable only to "God," and WE imposed upon HIM standards and codes that would most assuredly have cracked the "Man of Steel," himself even then. But HE was OUR President, and such was the price WE demanded of HIS attainment. Over the years, I grew up looking to the place, and to the man for all manner of miracles, and expecting to find them. Sometimes they happened. Often they didn't. Times changed. People changed. The office changed. The man changed. Did I mature? Did you? Did HE? And why have I now found myself, and most of us as well over the past year, staring at BACK door of the White House on nearly every screen, billboard and tabloid in the country? What has occurred, and why is it important? In fact, WE have a tragedy of the highest order ocurring there, under our very noses, and of our own making: a morality play of ancient Greek dimensions, which will inevitably have far reaching effects on our lives and those of our children, whatever its outcome. For those truly unfamiliar with the cast, they appear on the left side of this page, with questioning commentary alluding to their parts in the play. Bear in mind as the drama unfolds, that WE, the American people, long since changed from my childhood, TWICE placed in office the same man, whom we believed best reflected what we NOW stood for, but we failed to alter the standard to which we held HIM. The stage is set. The actors are in place, and the drama resumes. However, there is palpable irritation in the audience. Many have tired of the play and wish it to quietly end. Few understand that the play must continue, and that WE must become DIRECTLY INVOLVED, for it is indeed a reflection of who WE are now, and on its outcome may well rest who WE become. Again I was taught, alas as most of us were, that this simple banner (actually, rather complex I think) represented the "Land of the Free, and the Home of the Brave." Blood was spilled for it, so I'm told. So, as WE, the American people, set about internally fighting for, granting and legitimizing more and more personal freedom for ourselves, what has become the lot of those chosen to represent us to the world at large? What have WE done for them? WHO gave US the RIGHT to hold them to "standards" that many of us have long abandoned? Are WE so morally certain of our leadership requirements that WE sould practice and allow the public humiliation and sacrifice our leaders on altars that most other nations have burned and discarded with the rest of the ashes? What freedoms have we left them? 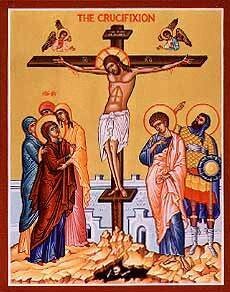 Growing up, as did many of us, I saw this every day in my home, at school, and in church. Like most of us, I was given very concrete messages about this religion and its influence on the formation of our country. I heard the "Battle Hymn of the Republic," and read of our "Manifest Destiny." America had "God" on her side, and could do no wrong. Very nice. Very patriotic. Indeed, very sanctimoneous. While I'd begun to see cracks in the our facade even then, it took over 30 years to fully discover that those concrete messages of my childhood were a lie. The "Founding Fathers," in several orations, writings and treaties often declared that in no way was America founded upon or even predisposed to the Christian faith; and that the operation of the nation should be supported by PRIVATE, rather than public morality. Yet, it is a prudish and demanding morality from this demeaning, demoralizing, dehumanizing, often paralyzing religion that much of our civil law, and the standard to which we insist our leaders to aspire derives. What is wrong with this picture? As were most of us, I was taught that this edifice was a paragon of virtue, and that from the "hallowed halls" of this devine structure came the machinations by which our freedoms were guaranteed and enhanced. That may well have been the case in 1787, when all the various documents were ratified, and our government finally and formally established itself. It couldn't be further from the truth today. Indeed, these "hallowed halls" have become a "kangaroo court," firmly bent on publicly linching OUR national leader for "weaknesses" and "inappropriate actions," to which at least two of its members have openly admitted their own "guilt." A case of the pot calling the kettle black? Or perhaps our infamous double standard... You be the judge. So here WE sit idly by, watching the play. Some cheer one side. Some cheer the other. Many are confused about why its even an issue. All the while, the original charter of the "Special Prosecutor" has been long exhausted and nearly forgotten in the name of "new sins." Yet it IS an issue. WE have allowed it to become an issue, and have covered the resulting media gladatorial circus with banners like the one above. Are we being entertained? And what of our personal freedoms? Note that I've placed the emphasis on WATCHING. And while WE watch, WE ALLOW a small, ravenously predatory political minority with a patently Christian religious agenda in OUR country to both publicly redefine our morality, and bring down their political opponent (not to speak of potentially influencing the next governmental formation) in the same act. And Nero fiddled while Rome burned... Isn't apathy fun?